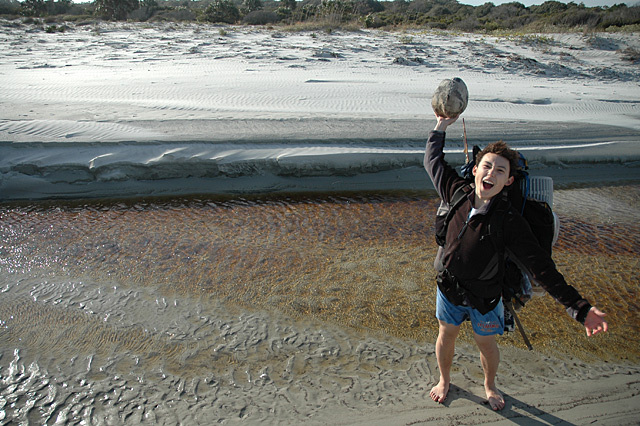 Shot while hinking on the beach of Cumberland Island, GA. The subject of shapes doesn't stank out to me in this photo, in fact the "sphere is lost in the sand or snow. I understand the play on words and still just doesn't make it for me. Nice photo indeed, but it doesn't meet the challenge. To emphasise the shape, you could try framing so that you have only the rock and the hand holding it, or perhaps the rock, hand and the model's head (trying to find similarity in the shapes of the head and the rock). Make sure your model takes off the backpack though, so that the objects sticking up from it don't distract attention from the shapes. The object in the person's hand is about the last thing my eyes settle on in this image. It's a nice photograph of a person -- lots of life -- but for this particular challenge I think it falls a bit short. 5. I wish your sphere was a little more prominent in this shot. It is not clear what it is (a coconut perhaps?) or why it makes the holder so happy. (Great expression though.) Also the coloring is a little drab. I can't figure out what shape you are focusing on here. I think it is the ball ... but really the shapes in the sand are quite neat. Proudly hosted by Sargasso Networks. Current Server Time: 04/23/2019 09:53:39 AM EDT.